Causes of demyelinating diseases include genetics, infections, viral, chemical toxins, and autoimmune reactions. A cochlear implant (CI) is a surgically implanted electronic device that provides a sense of sound to a person who has severe-to-profound sensorineural deafness. CIs bypass the normal hearing process; they have a microphone and some electronics that reside outside the skin, generally behind the ear, which transmits a signal to an array of electrodes placed in the cochlea, which stimulate the cochlear nerve. The primary auditory cortex lies in the superior temporal gyrus of the temporal lobe and extends into the lateral sulcus and the transverse temporal gyri (also called Heschl's gyri). Final sound processing is then performed by the parietal and frontal lobes of the human cerebral cortex. Broca's area is a region in the frontal lobe of the dominant hemisphere (usually the left) of the hominid brain with functions linked to speech production. Thus, speech processing areas and auditory areas are situated in fronto-parieto-temporal lobes of the brain. Because of the fact that demyelination of the neurons results in dyssynchrony, role of CI was debatable when the demyelination is affecting the brain because of questionable auditory and verbal outcome due to demyelination. 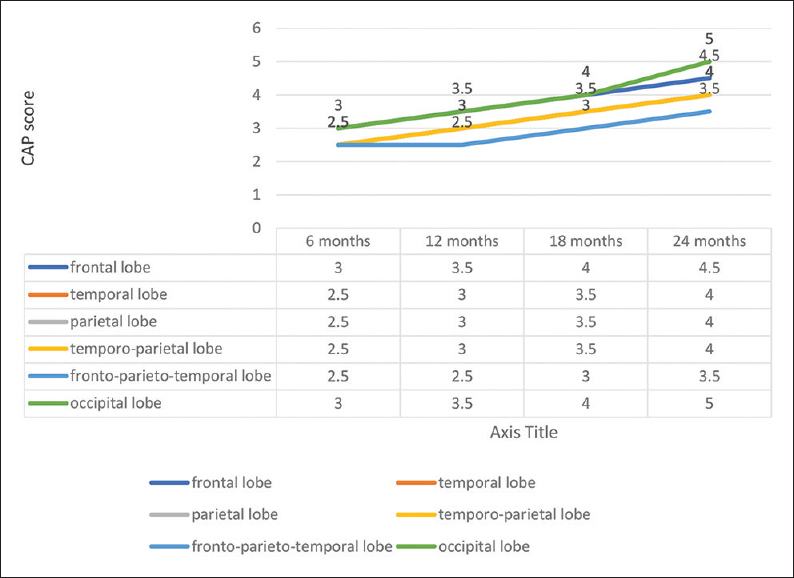 The objective of the study was to evaluate the auditory and verbal outcome in patients having demyelinating lesions of brain, following cochlear implantation, and compare the results with auditory–verbal outcome of the patients with normal cerebral myelination. This was a retrospective study carried out over a period of 3 years, from July 2012 to June 2015 at Apex tertiary care institute. Written and informed consent was taken from the guardians of all the children. Approval of ethical committee was taken before commencing the study. In this study, Group A comprised 30 patients who had demyelinating lesions in brain on magnetic resonance imaging (MRI) scan. Patients in the Group A were of age from 1 to 5 years, were congenitally deaf and mute, and had severe-to-profound sensory neural hearing loss on audiological tests. The hearing assessments of these children included appropriate behavioral audiometric techniques, objective measures of middle-ear function, acoustic reflex studies, transient otoacoustic emissions or distortion product (DPOAE), auditory brainstem responses (ABRs), and auditory steady-state response. Group B comprised 30 patients who were of age from 1 to 5 years, were congenitally deaf and mute, had severe-to-profound sensory neural hearing loss on audiological tests, and not having any other associated medical illness. These patients had normal MRI brain with normal myelination. None of the patients in control group had delayed development. 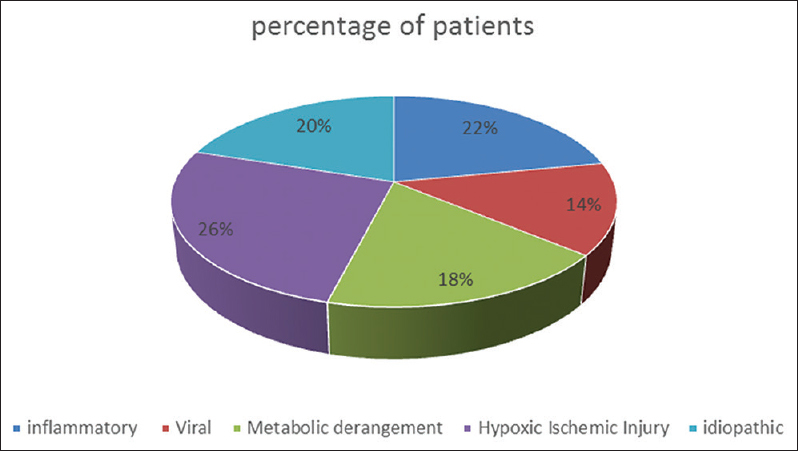 Of the 30 patients, 12% patients had frontal lobe demyelination, 20% patients had temporal lobe demyelination, 18% had parietal lobe demyelination, 25% had temporo-parietal demyelinating foci, 15% had fronto-parieto-temporal lobe demyelination, and 10% had occipital lobe demyelination. Out of 30 patients in Group A, two patients had delayed development. Preoperatively, these children received complete medical examinations at Civil Hospital, Ahmedabad, including related consultations in audiology, pediatrics, neurology, medical genetics, otolaryngology, psychology, speech pathology, and radiology. All the 60 patients underwent CI surgery. After placement of the internal CI devices, intraoperatively, we measured electrode impedances, visually detected electrical stapedius reflexes, and auditory response telemetry or neural response telemetry (NRT). These intraoperative objective measures were used to help program the speech processor for each child. Postoperatively, each child has had regular follow-up to assure complete healing of the surgical incision, to assess their general medical conditions, and for speech processor programming. Their hearing and communication skills have been assessed on a regular basis on categories of auditory performance (CAP) score and speech intelligibility rating (SIR) score; postoperatively, we have also repeated electrode impedance measurements, NRT measurements, otoacoustic emissions, and electrical ABRs (EABRs). We now have follow-up information of the children ranging from 6 months to 2 years. This assessment was done after 6 months, 12 months, 18 months, and 24 months after surgery. The 60 children implanted at Civil Hospital, Ahmedabad, have not had any postoperative medical or CI device complications. All of the children have shown significant improvements in their sound detection, speech perception abilities, and communication skills. All of the children have shown evidence of good NRT results. All showed evidence of good postoperative EABR results. 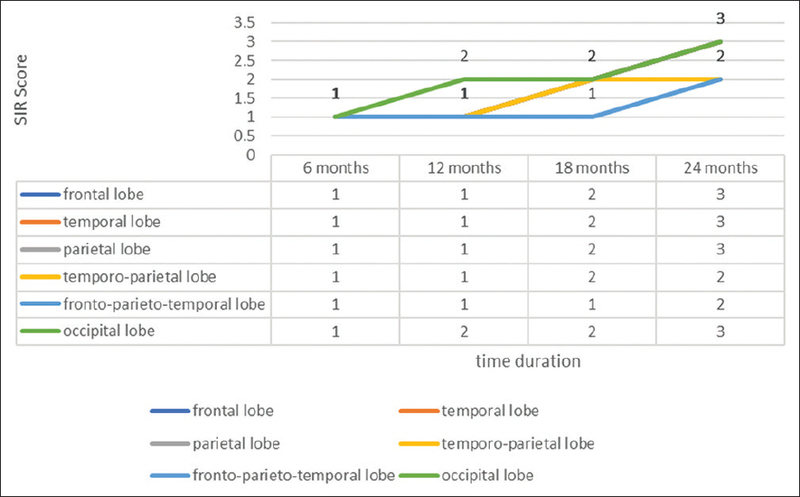 Auditory and verbal responses were assessed and scored on CAP and SIR scale at the intervals of 6 months, 12 months, 18 months, and 24 months. As per [Figure 5] Average SIR score in Group A at 6, 12, 18, and 24 months was 1, 1, 2, and 3, respectively, while in Group B, it was 1, 2, 2, and 3. As per [Figure 6] Average CAP score in Group A at 6, 12, 18, and 24 months was 1, 3, 3.5, and 4, respectively, while in Group B, it was 2, 3, 4, and 5. The results of CAP and SIR scores in the patients with demyelinating diseases of brain at the interval of 6, 12, 18, 24 months were comparable with the patients with normal demyelination of the brain. For SIR score, t-test was applied using IBM social science system version SPSS 17.0 (SPSS Statistics for Windows, Version 17.0. Chicago: SPSS Inc.) software (t = −0.24254 and P = 0.408222). The result is not statistically significant at P < 0.05. Hence, it can be concluded that there is no significant difference in SIR scores of patients with demyelinating lesions in brain and without demyelinating lesions in brain. For CAP score, t-test was applied using SPSS (Statistical Package for the Social Sciences) software (t = −0.67832 and P = 0.261426). The result is not statistically significant at P < 0.05. Hence, it can be concluded that there is no significant difference in SIR scores of patients with demyelinating lesions in brain and without demyelinating lesions in brain. 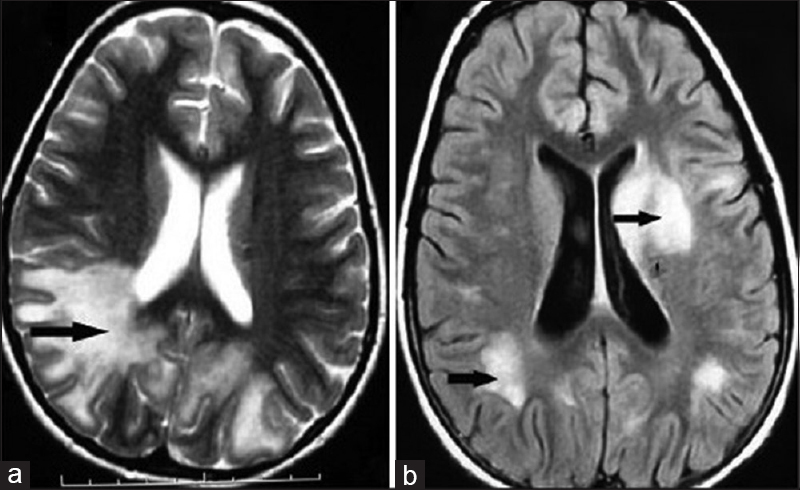 Average CAP and SIR scores according to area involved in demyelination are discussed in [Figure 7] and [Figure 8]. Myelination of neuron provides protection of neurons and helps in rapid conduction of electrical stimuli across the axon. Outer hair cells act as transducer which converts mechanical energy into electrical stimulus which in turn carried to the brain through 8th nerve to auditory and speech areas of the brain. In a patient with CI, the electrodes directly stimulate the 8th nerve, bypassing the normal acoustic sound conduction. There were logical bases for assuming that a CI would not be an appropriate or especially successful intervention for what researchers thought was that because of demyelinating disease there would be delayed and desynchronous stimulation. It has been shown that if a nerve fiber is stimulated electrically, both the growth of discharge rate and the maximum rate achievable are greater than when stimulating the nerve acoustically. In addition, the timing of the nerve response to electrical stimulation seems to be more precise and repeatable than it is for acoustic stimulation. Period histograms of neural responses show that spikes in the action potential occur more often around the phase peak when using electrical stimulation than when using acoustic stimulation, for which the spikes are more spread out along the entire phase curve (Abbas, 1993). The suggestion has also been offered that the discrete biphasic pulses used in most CI stimulation strategies may assist in increased synchrony of the firing pattern of the auditory nerve (Rance, 2005). Finally, the fact should not be overlooked that there can also be deterioration of the auditory neurons in patients with deafness due to sensorineural hearing loss, and these are the types of patients for whom CIs were specifically developed and who typically benefit significantly from the device (Spoendlin and Schrott, 1989). Thus, electrical stimulation can be more effective at producing a synchronous neural response than acoustic stimulation. In this study, the auditory–verbal outcome in the patients with demyelinating disease is comparable with patients with normal myelination. This suggests that stimulating the nerve electrically in patients with demyelinating diseases provides comparable results when compared to patients with normal demyelination. Our experiences with cochlear implantation for children diagnosed with demyelinating diseases of brain have been positive. The 30 children we have implanted have not had any complications postoperatively, and each child has shown improved listening and communication skills that have enabled each child to take advantage of different communication and educational options. Although sample size in this study was small, randomized control trials including a large number of patients should be done to establish statistical significance. Fernández O, Fernández VE, Guerrero M. Demyelinating diseases of the central nervous system. Medicine 2015;11:4601-9. Buss E, Labadie RF, Brown CJ, Gross AJ, Grose JH, Pillsbury HC, et al. Outcome of cochlear implantation in pediatric auditory neuropathy. Otol Neurotol 2002;23:328-32. De Leenheer EM, Dhooge IJ, Veuillet E, Lina-Granade G, Truy E. Cochlear implantation in 3 adults with auditory neuropathy/auditory dys-synchrony. B-ENT 2008;4:183-91. Jeong SW, Kim LS, Kim BY, Bae WY, Kim JR. Cochlear implantation in children with auditory neuropathy: Outcomes and rationale. Acta Otolaryngol Suppl 2007;(558):36-43. Madden C, Rutter M, Hilbert L, Greinwald JH Jr., Choo DI. Clinical and audiological features in auditory neuropathy. Arch Otolaryngol Head Neck Surg 2002;128:1026-30. Peterson A, Shallop J, Driscoll C, Breneman A, Babb J, Stoeckel R, et al. Outcomes of cochlear implantation in children with auditory neuropathy. J Am Acad Audiol 2003;14:188-201.